The expected molecular weight of FIH is 40 kDa. A band corresponding to this size is seen on the western blot analysis, and is competed away by the addition of FIH blocking peptide. A smaller band is seen, which is also competed away by the blocking peptide. In the A431 extract a nonspecific band of approximately 50 kDa is seen, which is not diminished by the addition of blocking peptide. Synthetic peptide corresponding to Human HIF1AN/FIH-1 aa 250 to the C-terminus (internal sequence) conjugated to keyhole limpet haemocyanin. Recombinant Human HIF1AN/FIH-1 protein (ab86916) can be used as a positive control in WB. This antibody gave a positive signal in the following whole cell lysates: HeLa; Jurkat; A431; Hek293 and Hela Nuclear lysate. Our Abpromise guarantee covers the use of ab12289 in the following tested applications. ICC/IF: Use at a concentration of 5 µg/ml. WB: 1/500. Detects a band of approximately 40 kDa (predicted molecular weight: 40 kDa). Can be blocked with FIH peptide (ab12306). Hydroxylates HIF-1 alpha at 'Asp-803' in the C-terminal transactivation domain (CAD). Functions as an oxygen sensor and, under normoxic conditions, the hydroxylation prevents interaction of HIF-1 with transcriptional coactivators including Cbp/p300-interacting transactivator. Involved in transcriptional repression through interaction with HIF1A, VHL and histone deacetylases. Lane 1: 20 µg of HeLa nuclear extract. Lane 2: 20 µg of HeLa whole cell lysate. Lane 3: 20 µg of A431 whole cell lysate. 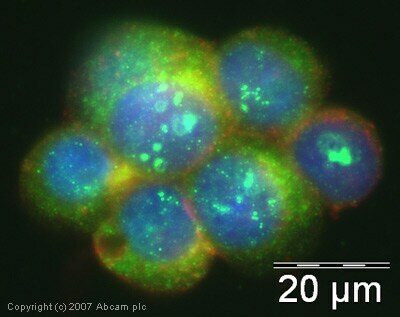 ICC/IF image of ab12289 stained human Hek293 cells. The cells were 4% PFA fixed (10 min), permabilised in TBS-T (20 min) and incubated with the antibody (ab12289, 5µg/ml) for 1h at room temperature. 1%BSA / 10% normal goat serum / 0.3M glycine was used to quench autofluorescence and block non-specific protein-protein interactions. 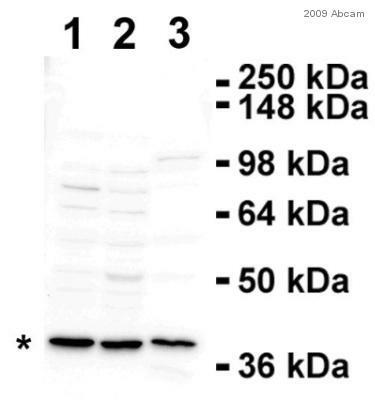 The secondary antibody (green) was Alexa Fluor® 488 goat anti-rabbit IgG (H+L) used at a 1/1000 dilution for 1h. Alexa Fluor® 594 WGA was used to label plasma membranes (red). DAPI was used to stain the cell nuclei (blue). Publishing research using ab12289? Please let us know so that we can cite the reference in this datasheet. Needs HIF1AN antibody that is guaranteed to work in mouse and does not cross-react with other mouse proteins. Thanks for your call yesterday and for your patience. We have two HIF1AN antibodies that have been tested with mouse samples and are guaranteed to work in mouse: ab92304 and ab63163- https://www.abcam.com/HIF1AN-antibody-ab63163.html https://www.abcam.com/HIF1AN-antibody-EPR3659-ab92304.html I did not find any data showing these antibodies used against knockout samples, but I would not expect them to cross-react with other proteins. 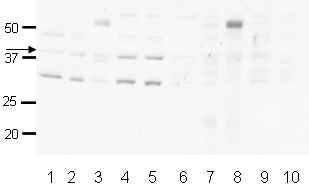 Regarding ab12289, do you have any testing data such as a Western blot image that you could send? What kind of mouse tissue was used in this assay? I look forward to hearing from you. Please let me know if you have any questions or if there is anything else that we can do for you.